There’s a place in Happy Hour City for the classical, the historical, and the fancy. That’s the sort of honor that this week’s DOW represents, we’re talking about a French 75. The cocktail that dates back 103 years and still is as popular today as it was back then. It has other names such as a 75 Cocktail or in French simply a Soixante Quinze (Seventy Five). 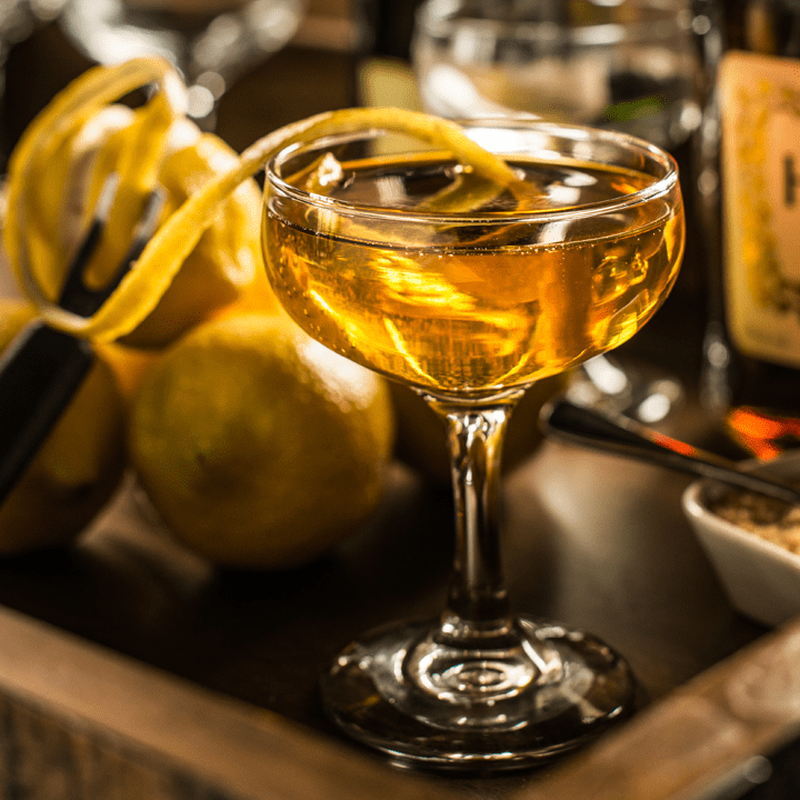 Despite its many aliases, it’s a drink simply made of Cognac, Champagne, Lemon Juice, and sugar. But it depends on where you’re from for the kind of liquor that goes in it. The French use Cognac, the British use Gin, the Americans use Bourbon (French 95) or Brandy (French 125). The one constant is the Champagne which is why it’s a great drink during New Year’s Eve. If you like simple cocktails that are recognized as classy throughout the entire world this drink is your winner. There is also its cousins- French 76 (with Vodka & Grenadine syrup) and the French 77 (with St-Germain Elderflower Liqueur). You could even opt for a Mexican 55 and get it with Tequila. With so many choices, what’s not to love? -The when, where, and how of this drink’s importance and beginning in history is not very well known. It’s just one country’s version has gained the most popularity by using Gin vs. Cognac; the Brits. -The French 75 was originated during WWI (1914-1918) the first mention of it can be traced back to a 1915 issue of The Washington Herald. Back then they used to make the cocktail with Applejack. -The drink had been brought over from the shores of France to America, and the credit went to Harry MacElhone for making it but historians agree Harry only brought it to London and eventually America from a different bar right down the street from his. Henry Tepe’s bar, which began making it with Cognac. Plus, Harry never took any credit for the drink. -Eventually, the drink circulated many cocktail books which were incredibly popular during Prohibition and everyone enjoyed them. The glass has been switched throughout time, it began in a coupe cocktail glass, then in the 1920’s, it was switched for a Tom Collins glass where it remained until the use of flutes for champagne in the 1980s. It’s named after a machine gun used in WWI the Canon de 75 modele de 1897, AKA the 75mm gun. It was seen as a symbol of hope in the war against Germany. It’s a drink known for hitting you with the force of a 75mm gun.